Purpose: Use this document as a reference for how to understand the DRS calendar's relationship to jobs and payroll at a high level in ctcLink. This was needed because DRS expects retirement funding to be reported "as earned" as opposed to "as paid"
To add to an existing DRS Calendar select an existing Calendar ID from the Search window and simply press (+) in the upper right hand corner and enter the same information as creating a new DRS Calendar from Fiscal Year down. Is the employee retirement eligible? Is the employee in a DRS administered retirement plan? Contract Begin Date and Contract End Date will need to be filled into CTC Job Data. Contract Begin Date should be the first day of the first valid Pay Period in which they will be paid. Contract End Date should be the last day of the last valid Pay Period in which they will be paid. No further entry in CTC Job Data is needed for DRS. Contract Begin Date and Contract End Date will be retrieved from page FWL Employee Contract Data in Workforce Administration. Is it paid through the Faculty Workload customization? The FWL customization pays out contracts with standardized amounts at regular intervals and therefore does require the Job associated to have a Contract Begin and End date as well as a DRS Calendar. All PTF contracts and FTF Moonlight contracts paid through FWL need redistribution should the employee be enrolled in a DRS retirement plan. Note: Classified and Exempt employees, barring exceptions, are typically calculated on Payroll actual hours and therefore typically do not need a DRS Calendar in their Job Data. Hourly employees fill in positive time and should never need a DRS Calendar, DRS wants their time sheet information directly. Facuty, Correctional Faculty and Part Time Faculty DO need a DRS Calendar, as well as Contract Begin and End Dates so that redistribution will happen accurately. 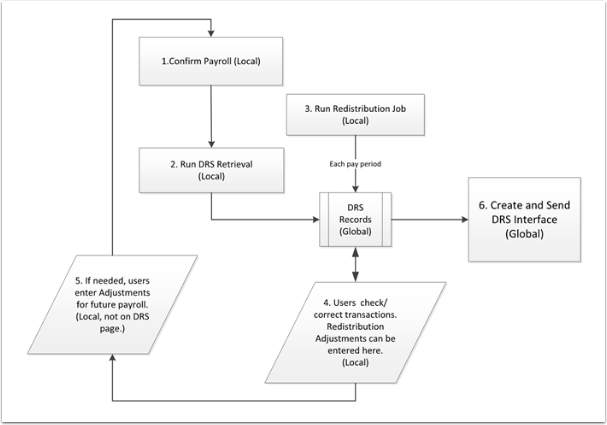 Redistribution will only happen if DRS Calendar AND Contract Begin AND End Date are populated and are present during the processing of the current Payroll period . NOTE: DRS can fine the college if there is an external audit and it is determined that processes are not handling hours correctly. Colleges should conduct regular internal audits of CTC Job Data to ensure these fields arepopulated both correctly, and in a timely fashion. Note that DRS can fine the college if there is an external audit and they conclude that processes are not handling hours correctly so regular internal audits of the CTC Job Data should happen to ensure these fields are populated together in a timely fashion. 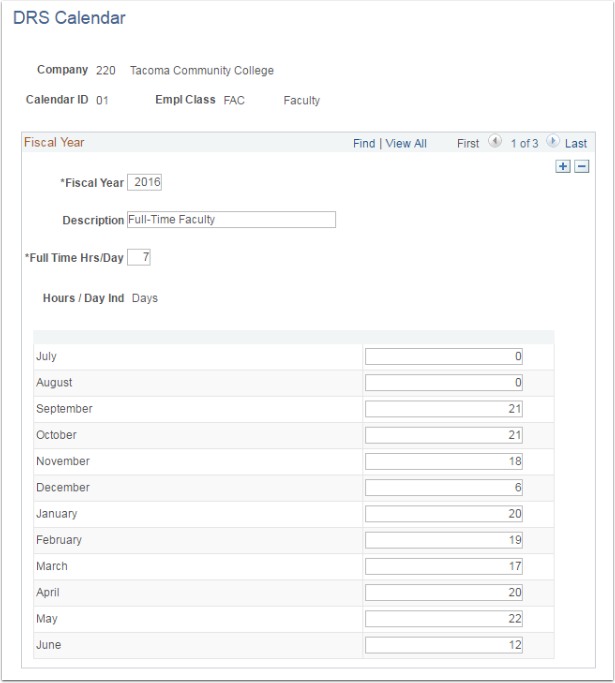 In the case of termination, if there is no Contract Begin & End Date but a DRS Calendar is referenced, college HR staff must make a manual adjustment to match the actual as reported by Payroll. If the adjustment is not made, the calendar will take the “usual” ½ month pay period. 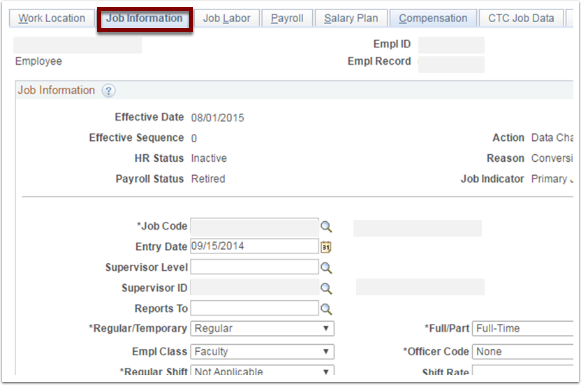 A custom page in Job Data was created to accommodate information not delivered PeopleSoft. This is the tab named CTC Job Data, and is where the DRS calendar code should be entered.